The Kassel(TM) 13' Diameter Globe with 57pc Chess and Checkers Set will entertain for hours. Start a weekly family game night and start a conversation. The outside of the globe features an Old World nautical map finish. Integrated dark brown wood holder and table stand. Globe opens completely to reveal the exquisite design of the game board. Game pieces store under the board. Stand measures 22-1/2' tall and 16-1/4" in diameter. 24 checker pieces, 32 chess pieces, 1 game board. 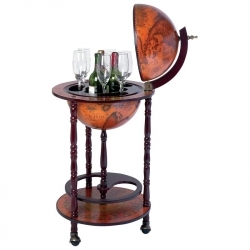 The Kassel(TM) 17-1/2" Diameter Wine Globe displays your favorite wine and glasses in stately, old world charm. Dark brown wood holder and table stand. Antique finish-look feet. Stand Measures 17-1/2" in diameter, 35-1/2" tall. Contents not included. The Kassel(TM) Replica of Italian Hand-Painted Bar displays your favorite wine and best glasses in stately, old world charm. 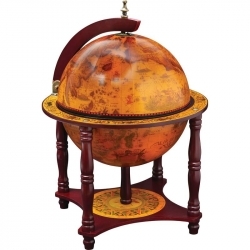 The outside of the globe features an Old World Map of the Earth, and the inside opens to reveal a View of the Heavens in faux antique fresco. Integrated dark brown wood holder and table stand. Antique finish-look hardware cap detailed feet. 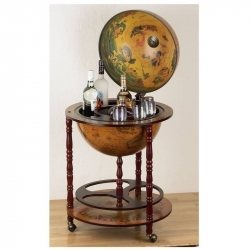 Globe measures 17-1/2" in diameter, stand measures 22' in Diameter, 3 feet tall. Contents not included.